Thanks, Tom. Wonderful big vintage photos of Schweikher's Illinois home, and accompanying HABS drawings in a novel format, without the usual border and title block . . .
SDR: I'm writing a blog post on the Upton house in Scottsdale, AZ. Can you tell me the source of the floorplan you posted earlier in this thread? 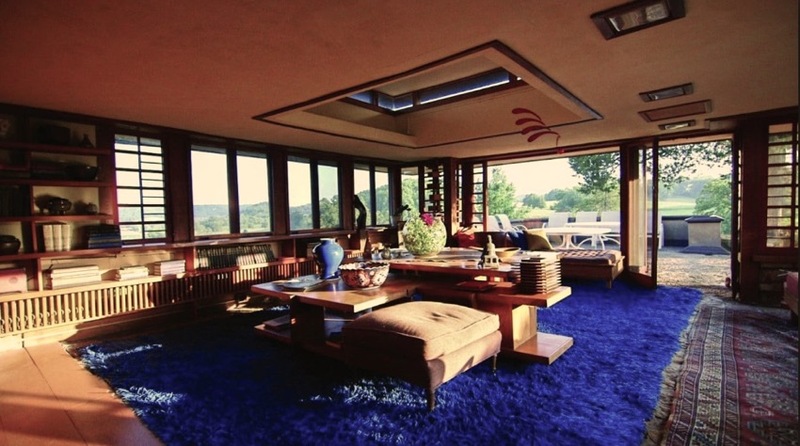 Also, there is another Schweikher/Elting house in AZ also in Paradise Valley featured in Progressive Architecture Nov 1950, pp 53-57. It includes many great photos by Julius Schuman. Ho-ho---what a treat ! Nicely done; restrained saturation. I no longer recall where that plan came from; I believe it may have been contributed by a reader. I'll investigate---and post or send the largest file that I have. Can you provide a photo of the model at MoMA ? Shulman was a good photographer, and we owe him a great deal. However, he tended not to provide much information in his texts about the architect or the commission. For instance, in "Architecture and its Photography," he gives only the date of his photograph, not of the structure photographed . . .
His record of the Upton house is priceless, in any event. SDR: Thanks for your swift reply! I think the plan is probably from the 'Built in USA: Post-War architecture' MOMA exhibition brochure as it appears there in the same form. Oh---well done. I have the book; I wonder if that's where I got the plan. The book is undated; designed by Alvin Lustig, preface by Philip Johnson, introduction by Hitchcock, text by Arthur Drexler. The only color photo is opposite the title page: the Johnson Wax Research Tower, photo by Stoller. I'm glad to learn from your PDF that the date is 1952. Became slightly obsessed with the Upton house, so I worked on a 3D model, creating some renderings and a walkthrough video. 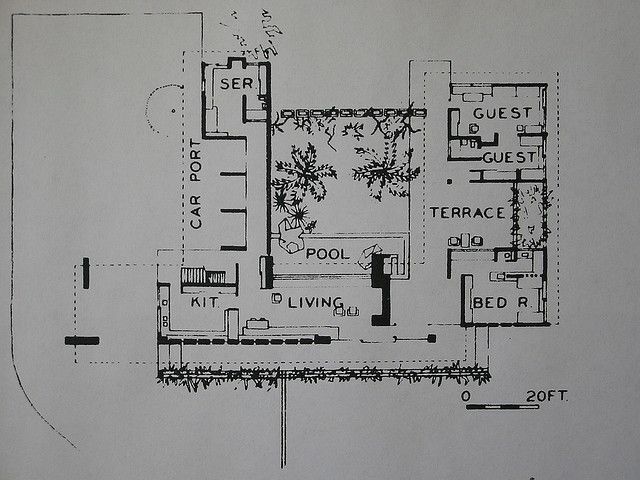 I also found an interesting earlier scheme for the house that was published in 1946 with angled walls and other changes. Bravo---you really brought the house to life, Tim ! Well done. I can't wait to listen to the conversation between Schweikher and Bruder . . .
SDR: Thank you so much! I lost a couple days figuring it all out but it's a wonderful structure to experience in 3D. Makes the fact that it was destroyed meaninglessly even sadder somehow. Well, we'll have to put it on the short but growing list of buildings we'd like to recreate---somewhere . . .
Bruder is quite the teller of the tale of Wright in Arizona. Not to be missed, warts and all---very useful. 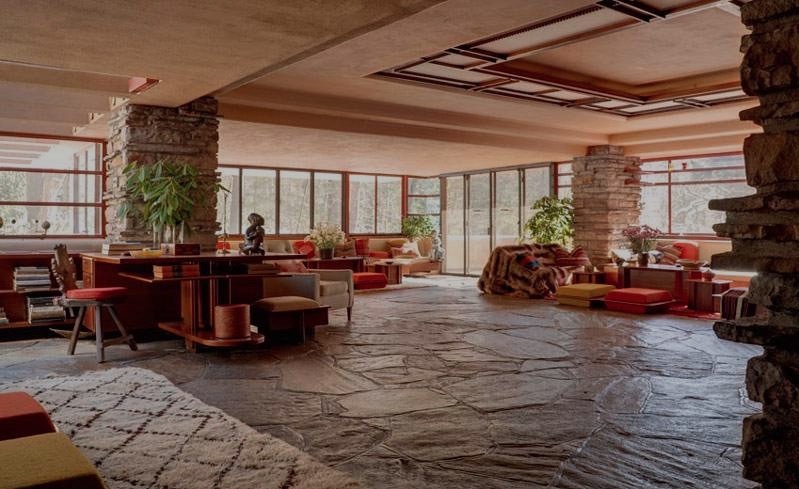 Here's Will Bruder's contribution to the story of Fallingwater . . . The question would be: which room, as pictured, came first ? Bruder's your man for Schweikher studies---no doubt. Let's hope he finishes his book. So: Upton I and II (before and after a fire) ? Adobe ? David Wright I and II ? It should be noted that the Upton House was built by Contractor George Ellis ... the same man who built the Pauson House, so he had quite a bit of experience building walls of desert concrete by the time of the Upton House. Even by the 70's Ellis was still fuming over being shafted by Mr. Wright, who told him that he could count on apprentices from Taliesin West ... helping with construction during the summer construction period. "None of them ever turned up", he told me, clearly incensed.